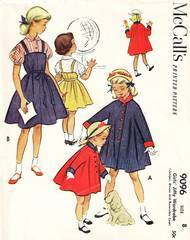 Original vintage McCall's sewing pattern 9096 from 1952 for Girls' Jiffy Wardrobe. The reversible coat has long kimono sleeves cut-in-one with the coat and brief collar, also cut-in-one with the coat. Blouse has short puffed sleeves cut-in-one with blouse, button front closing and Peter Pan collar. Flared jumper with shoulder straps and tie belt. Girls Size 8, Breast 26, Waist 23, Hip 30. Pattern is complete. The blouse pattern pieces have been very neatly cut and folded. All other pieces are in factory folds. Envelope is in very good condition.